The Coptic New Year is the very first calendar ever known by man on planet earth! It goes back 4241 BC. The word "Nayrouz" is of Coptic origin. The stem is niiaro-oo meaning: "the rivers." The suffex "ouz" is Greek, thus, the word "Niiaroouz." Mid September is usually where the waters of the Nile river rises, so the prayers are lifted to God for the rising of the waters of the rivers for irrigation and ask for His blessings at the beginning (crown) of the Coptic Calendar year. When the Persian ruled Egypt from 525-405 BC, they adopted the word and incorporated it in their language and took it to mean "the beginning of their Persian year," and called it "Nayrouz." The word "Nayrouz" in Persian, means "the new year." On celebrating this feast three things are stirred in our minds. - Honoring the millions of martyrs who sacrificed their lives as sacrifices of love for our Lord who sacrificed Himself on our behalf. - Joyfully celebrating the beginning of the Coptic New Year. - Expressing of our flamed eager for the last advent of Christ. Through the last two weeks before the feast the readings of the liturgies of the Eucharist concentrate of the Parousia of Christ. I asked myself; What is the relation between honoring the martyrs, the celebration of the new year and the Parousia of the Lord? As I started to speak to our kids in the Church about El-Nayrouz I asked: Is there a sun in the Paradise?? Truly the Sun of Righteousness, our Lord Jesus Christ, is the ever shining Sun. There is no place for sunset in Paradise; there is no night, no days, no weeks, no months, no seasons, and no years. But we attain a unique day without night, an everlasting day. In it we receive the brightness of the Sun of Righteousness that reflects on our souls and our risen bodies. 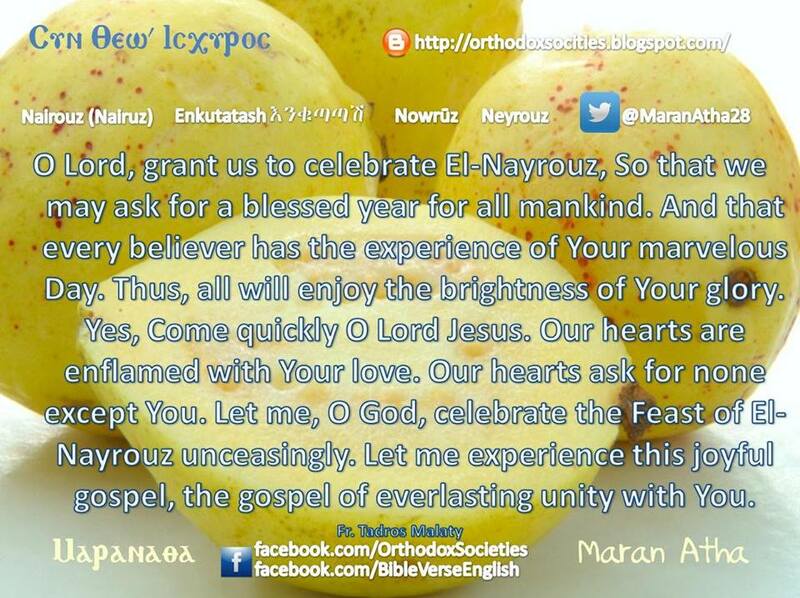 Through the celebration of the Feast of Nayrouz, we start a new Coptic year. At the same time we declare our eagerness to share with the martyrs, a new Day which they attain in Paradise. They have the experience of brightness, through which the brightness of the glory of Christ shines on them; they have no need of a sun nor a moon. There is no room for various seasons, nor of night and day. They are not in need of food. In the Feast of El-Nayrouz we are longing for the eternal life. In the feast of El-Nayrouz we behold the opened gates of Paradise. We see our Christ coming to carry us on the clouds, together with those who already entered the Paradise. All of us will enjoy the divine throne in heaven. Our hearts are inflamed with Your love.